On the opening night of the BB&T Atlanta Open, 70’s soul legends, the Commodores, performed for an ecstatic audience of tennis enthusiasts. The night was crisp as fans bopped in their seats to the “old school” Motown jams. Located on Stadium Court, the stage lit up with flashing lights as the members of the band broke out into soulful dance and renditions of their past hits. The concert had wrapped up a night of charity and tennis as The Commodores kicked off their set with boisterous medleys. Unbeknownst to many fans, band member William King is not only a top contender on the stage, but on the tennis court as well. Though King had pursued a successful career in music, he also currently plays in many high level USTA tournaments at the national level. King was scheduled to play in an exhibition with Rock 100.5 radio personality Jason Bailey before the Wild Card Challenge final on Wednesday, but was unable to participate due to injury. Although King manages to maintain success on the tennis court and music scene, perhaps a career with music was the best route as the band has achieved many accolades since their start in 1968. From opening for The Jackson Five to winning a Grammy, The Commodores have made their mark in music history. The BB&T Atlanta Open also continues to make history as players all around the world travel to the city to show off their talent on hard courts. Earlier in the evening, the No. 2 German tennis player Benjamin Becker stated, “The tournament has a good mix of veterans and some promising newcomers. 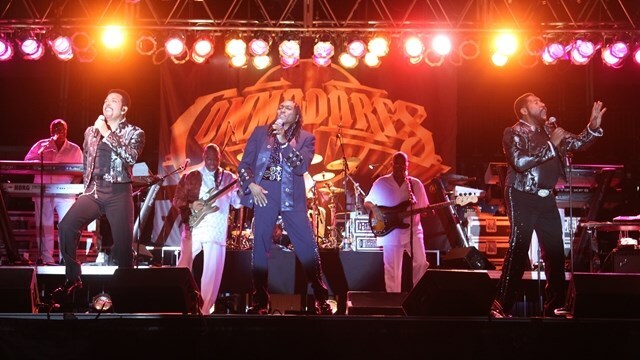 This is going to be a fun event.” The Commodores performance was a perfect kickoff to this entertaining event. From July 25 to August 2, the BB&T Atlanta Open is sure to dominate the entertainment scene in Atlanta, Georgia.